Technology evolved really fast in the past few years. While we never actually considered listening to Christmas music on the internet as we had cassette tapes and CDs, nowadays there is an obvious trend that is connected to the online world. There are various options that are available and you no longer have to actually purchase Christmas music. We first had YouTube, which allowed us to listen to most of the Christmas songs that we love. This is still an option but we have one disadvantage in this case. We are referring to the fact that you need to keep changing songs. The alternative would be to basically rely on a pre-set playlist or to create your own. However, since there are many things to plan for Christmas from planning your Christmas vacation to finding Christmas cookie recipes, you will most likely not have the time to prepare the playlists. 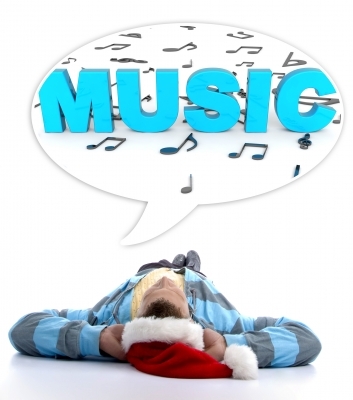 With this in mind, let us think about the top 5 online Christmas music sites that you might want to consider. Most people do not even know about CBN Radio so it should come as no surprise that the Christian Online Christmas Music radio is even less recognized. You can find it here and we are confident in saying that you will appreciate the music selection that is offered. One huge advantage of using it is that you can download the iPhone app. Also, you can join the newsletter to receive Christian emails. If you are not religious, do not worry too much since you can always just stay focused on the music. There is a selection of Christian carols with regular Christmas songs but you will not find something that is different like the Axl Rose version of White Christmas. Shoutcast is one of the most well known online aggregate services for radio stations. 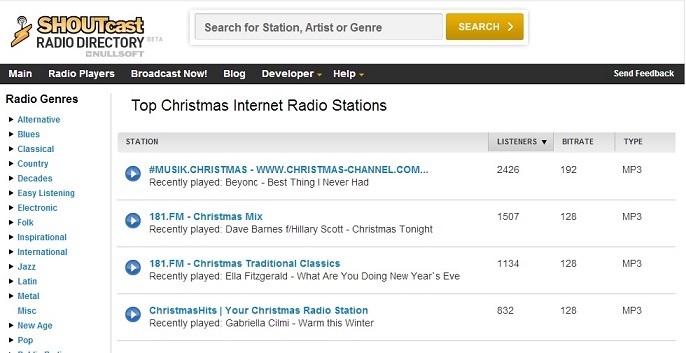 You can find thousands of online radio stations there and when you check out this tag, you can see all the radio stations that broadcast online and that have a Christmas theme. Make sure that you choose the radio station according to personal music tastes. For instance, if you like country music, you will want to focus on an online Christmas music station that plays country songs. Do so for jazz, rock and so on. You will definitely locate at least one station that you would love here. Live365 is similar to Shoutcast. If you know one site, you most likely also know the other one. Live365 also has a Christmas radio section and you can browse it with ease in order to find something that you would love. At the moment there are 81 Christmas stations that are covered. Some only play oldies but goldies while others have a focus on more modern music. Once again, choose base on your preferences. Tune.in is a rather new service on the market. It is different than other similar websites in the sense that you can play all the listed radio stations from your internet browsers. The site also has various social features. You can highlight the songs that you love and create lists of favorite radio stations based on your personal aspirations. Keep in mind that you can also take advantage of suggestions from friends that use the site. However, at the moment you are surely only interested in the Christmas music selection. If so, click here to see what options are currently available for you. 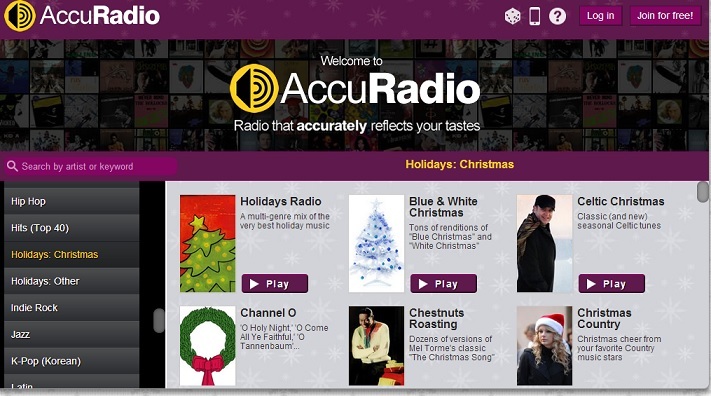 AccuRadio is quickly gaining popularity at the moment and if you want something fresh this Christmas, take a look at this link. One of our favorites is the Celtic Christmas selection. It is one that is interesting but you will find other options too if you are not into that kind of music. There is even a pretty nice online Christmas music for kids selection that you can take into account. We talk a little more about this topic in the section below but what has to be remembered is that keeping kids entertained can be hard during the holidays. The time factor will still be a problem when referring to the Christmas music selection that you will need to make this year. 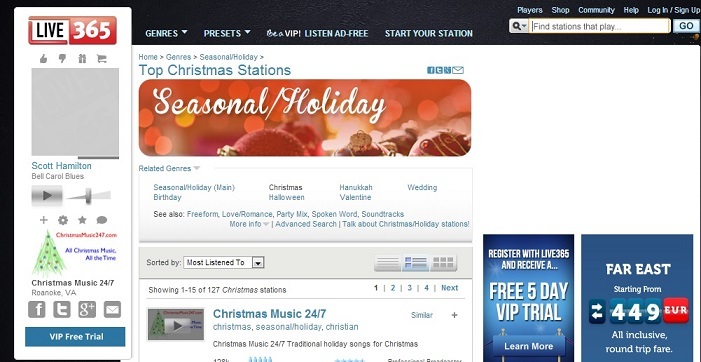 It might seem like all you need to do is basically visit the sites above on Christmas Eve and then select a station. What do you do in the event that you do not like the station? Getting into the Christmas spirit is not something that you do on Christmas Eve. We actually recommend that you start at least 2 weeks in advance by doing those things that are characteristic to the holiday. For instance, you can start looking for gifts. If you want to make your own gifts, you would have enough time to simply find great homemade ideas. While you make the gifts, you can listen to some of the Christmas radio stations. Do so for all holiday related activities. As time passes, you will be able to make a list of the considered online resources that you can use. That would help you out a lot since during the Christmas evening you already have the selection finished. You would thus end up listening to exactly the type of Christmas music that you would love. Make sure that you think about your guests in the event that you organize a Christmas party. In this case you have to take the necessary time to combine the online Christmas music with regular party music. You can create your playlists in advance but there is a pretty good possibility that you can only use the online radio version when you open the gifts or during dinner. When children are involved, the online Christmas music selection should be different than when only adults participate. The music has to be jollier and the classic Christmas carols are usually the ones that you have to consider. Remember that children have short attention spans so you have to keep them entertained.